Some folks are affected by peanuts. I see peanut butter and peanut-containing products all over supermarket and gas station shelves. Some people believe that the government is spraying something into the air, and this creates unsual looking contrails. They call these “chemtrails”. 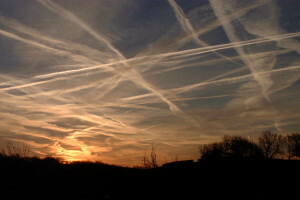 Now, there is no real evidence that “chemtrails” are real, but there are several myths on the internet about “chemtrails”. All these myths can very easily be shown to be false, and I’ve gathered the most popular myths here as a little time-saver for the person who has encountered “chemtrails” for the first time. Is there any peer-reviewed papers on this whole deal? None of which I am aware. Kind of like a peer reviewed paper on the alien autopsy at Area 51 where there just is not a lot of study. The lack of study is then attributed by some to the conspiracy rather than the lack of scientific basis. Thanks, Johhny. No doubt that the toxic metals and chemicals are causing the headaches and sneezing. They were at it again this afternoon, laying trails from 2 PM until sunset, all the way from the coast inland to central Florida. Found another excellent site: http://www.geoengineeringwatch.org. Have you viewed Michael Murphy's film "Why in the World Are They Spraying? I went to the site and signed up for the newsletter. I haven't seen the film only because I can't stand the fat POS lib. Where exactly are the results for these lab results from anywhere? Just claiming there have been spikes is not proof of anything other than the ability to make a claim. What is the chemistry supposed to be for these programs? How is it supposed to be applied? Do you add it to the fuel or is it a a completely additional weight, which is far from insignificant in either case. The KC-135 family is often claimed to be the source. Well, there were only 417 in the entire air force in 2010, including the reserve and guard units. The flight hours per year are generally less than one hour per day per unit on average. So, how do we get these huge numbers of "chemtrails" every day without similarly huge numbers of planes which can be dedicated for that operation? The theory fails the math test and has no evidence outside of unsupported claims on a blog. The "theory" fails the math test and has no evidence outside of unsupported claims on a blog. BTW, it isn't everywhere all the time, either. Who pays for this enormous expense? Well we all do, especially at the pump. For background estimates, the variants of the KC-135/707 generally use more than 10,000 lbs/hour in fuel, which is ~1200 gallons of the least dense (0.8 kg/L) fuel. This provides enough water vapor to form a condensation trail that we see when contrails form. This is natural condensation of aersols as opposed to the 100 to 500 gallons being sprayed as an aerosol. The spray is going to consume a greater weight of liquid since the addition of metals would increase the density proportionally. At 1200 gallons per hour fuel consumption that is 20 gallons a minute, which if we assume is similar to the slower application of the mystery spray that is more dense, giving us a 5 minute application with 100 gallons and a maximum of 25 minutes of application. Neither of which would seem to give the coverage attributed to this mechanism, especially given the chemtrails are supposedly bigger in diameter than contrails. The math does not work any way you try to do it. Too many people would have to be involved to keep it quiet, too much material is required for commercial aircraft to create a chemtrail of any size, and there are too few planed which could be dedicated to such a program. Why exactly are these not contrails? Again, it is more of a blog than anything else, especially when most of the information presented comes from just one person. I guess if I can't pull your head out of the sand, no one can. Your mind is rigid and made up, and fails to see connections. The miss-information and denial campaign has worked with you. There are so many conspiracy theories, it is easy to throw some factual things in with them, to give you credit for other denialism you don't grab at in the AGW field. My head is not in the sand as I have given the math calculations, the background levels of barium and how abundant aluminum is in the biosphere to show the claims made do not add up. In response I am asked to take several hours and read unsupported ramblings that are supposed to make up my mind. Deb what you are seeing is simply pollution. I have flown gliders for many years in Australia, and on occasions I have hit pollution layers that were so thick, that they stung my eyes, and smelt real bad. Now the areas I have encounter these effects were well over a hundred miles from the nearest large population, and we only see the occasional con trails or for that matter any large aircraft. Con trails are just water vapour or ice crystals. How quickly they dissipate depends on the temperature and the level of water vapour in the air, when a cold front approaches, the level of relative humidity rises, and the temperature at height falls this promotes the formation and spreading of con trails. Under some conditions the con trials disappear within minutes, in the example above they may last many hours so seeing a lot of con trials doe not mean there are more aircraft than usual, it simple means you are seeing the the trails made over many hours. It is also worth pointing out that the upper winds will bend the trails into into long curves. The same cold front is likely going to give you northerly winds which will be carrying a larger load of pollution than from most other directions. Sorry but the theories about deliberate spraying are just rubbish. You would have to put thousands of aircraft into the air, to produce an effect on the air quality, that was noticeable at ground level. What is a very serious problem is the level of pollution, that is being produced by our ever increasing use of fossil fuels. so much so that it is causing a a global dimming effect.